Greetings again World Mystery readers! My name is Marty Leeds and this is the third article in a series I am writing regarding the subjects of sacred geometry, sacred number and gematria. I am the author of two books, Pi – The Great Work and Pi & The English Alphabet Vol. 1 (with Pi & The English Alphabet Vol. 2 coming due this month). My website is www.martyleeds33.com and I have a youtube channel (youtube.com/martyleeds33) with an extensive video series detailing a wide variety of subjects and their relationship to mathematics, numerology and gematria. I am also a teacher at the School of the Holy Science (www.schooloftheholyscience.org) along with some fantastic thinkers and researchers such as Santos Bonacci, Johan Oldenkamp, Bill Donahue, Jason Verbelli and a growing list of others. I want to thank you in advance for giving me the opportunity to bend your ear. Gematria is the art of assigning numbers to letters to reveal deeper meanings behind words and phrases. Gematria is an art that has been practiced in many cultures and played a quintessential role in helping one understand the hidden meanings of ancient spiritual texts. The Holy Bible is a book rich in numerology, sacred geometry, allegory, symbolism, morality, psychology, philosophy and astrology – but in order to truly grasp the gems that lay hidden between the lines, one would need to read it using the ancient art of gematria. Numbers are a creation of the cosmos and of God and are the alphabet we are given to speak to the divine. Numbers represent the cosmological principles that perform the magical act of constructing our world. Numbers were not crafted by the hands of man. 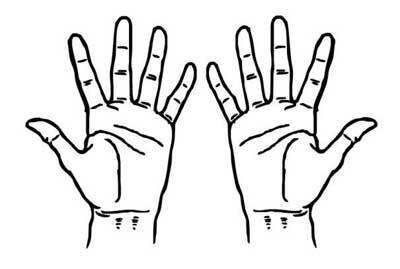 Numbers, in fact, conversely, crafted the hands of the human being. Understanding the universal language of number is a direct way to communicate with the divine source of creation, for this is one of the distinct ways in which the divine chooses to communicate with us. Creation itself is a numerical matrix, with number the language the natural world uses to weave the web of life and sing the universe’s song. In the first article in this series, we took an in-depth look at the cryptogram or chromatic cipher (chroma meaning “color”, with the seven primary colors recognized in the numbers 1 – 7) occulted, or hidden, beneath the 26 letters of our English Alphabet. This cipher allows us to journey into the mathematical structure within the English Alphabet and is one the author begot by utilizing simple, powerful, philosophical constants, such as symmetry, equilibrium and harmony, to unveil its formation. We will be going over the cipher rather briefly here, but if you would like a detailed explanation of it, please read the first article in this series, watch the video here:http://www.youtube.com/watch?v=TyjD2IWgD-A ….or check out Pi & The English Alphabet Vol. 1 and 2! Splitting the 26 letters of the English Alphabet in half, establishing 13 letters per side (A – M – left side & N – Z – right side) allows us to form symmetry with our alphabet. Using the motif of the 7 days of creation in Genesis (the six days of work with God resting on the seventh, or Sabbath – See Genesis 1 – 2:3, Holy Bible – King James Edition) we can assign numbers to the letters of the alphabet (A1, B2, C3, D4, E5, F6, G7) By resting on the Gand the 7th letter, we find a direct correlation to the Freemasonic symbol of the compass and square. Walking back down to one from the G7, we can assign numbers to the remaining letters of the left side of our alphabet (H6, I5, J4, K3, L2, M1). To maintain our symmetry, or to create balance within our alphabet, we can apply his entire philosophy to the right side of our alphabet, N – Z.
Utilizing the symbol of the seven-branched Jewish Menorah, we can highlight our non-prime numbers (a prime number being a number divisible by 1 and itself) with those non-primes being 1, 4 and 6 and 6, 4, 1, on both sides of our alphabet, with the central pillar resting on our 7 or Sabbath. Adding our non-primestogether, we find the number 22 (1 + 4 + 6 + 6 + 4 + 1 = 22). 22 divided by our central pillar of 7 equals 3.142, a whole number approximation of the transcendental ratio Pi. Combining both sides of our alphabet together, 22 / 7 = Pi and 22 / 7 = Pi, or Pi begotten by 7 and Pi begotten by 7 , forms what is known as the Tetragrammaton, or the holy name of God, also known as Yahweh, or Jehovah. In the Hebrew Gematria, the Tetragrammaton summed to 26. Using our cipher we can find the numerical equivalents for the two names of God found in the Holy Bible, LORD and GOD. Notice both Lord and Godsum to 13 recognized by the 13 letters on each half of our alphabet. Combining the two names into LordGod, we find the number 26, recognized in the Hebraic Tetragrammaton as well as in the number of letters in the English Alphabet. In this article, we are going to be using the above cipher to decode the holy name of Jesus Christ. Before we launch into this endeavor though, I want to put all my cards on the table to be very clear to the reader who I am and what my aims are in writing this article. I am a completely independent researcher. I do not belong to, or am purporting, any sort of religious organization. I do not, and have never, subscribed to any one religious system, text or dogma. I do not habitually pray, meditate, attend church or profess my allegiance to any specific God. Though I have sought divination through many different practices, I was never indoctrinated by any singular belief system. I have no agenda other than an earnest and honest desire to try to make sense of this world. My only goal is to try to understand the mysteries that we are surrounded by and share any insights I have, and discoveries I make, with whoever wishes to inquire of them. Bill Donahue, a colleague and teacher at the School of the Holy Science (www.schooloftheholyscience.org), once exclaimed in one of his beautiful sermons that, “Fundamentalism isn’t the problem in religion. Fundamentals are good. The problem with religions today is literalism.” I never understood how someone could pick up the Holy Bible, and for even a moment, arrive at the conclusion that it is somehow a book of historical facts or a literal account of actual events. Does one actually believe that there was a chap named Jonah who lived for three days in the belly of a whale? Does one actually believe that Noah built an ark and got all the animals, two by two, from all around the world, to sail with him and withstand a great flood? Does one actually believe that the world is only 6,000 years old? How is it that moderns can vehemently believe and defend a literal interpretation of something that is so obviously allegorical? With but simple common sense, one can easily see that these stories are more mythology and poetry, than historical fact. That said I do not wish to tell another person what to believe. At some point I adopted, and took to heart, some basic fundamental philosophies, one of them being the Golden Rule. “Do unto others as you would have them done unto you.” As downright ludicrous as it seems to me that someone would believe in the folly of literalism, I have made a sincere effort in my life to not try to judge them or condemn them for their beliefs, even if their beliefs condemn me. And that is not an easy thing to do. And I have often failed in my attempts. Why is it that, almost universally, our ancient ancestors believed in a God or Great Spirit? In all corners of the Earth, in every jungle, city and mountain top, people professed their love and adoration for a creator being. In nearly every civilization, tribe and culture that has graced this blessed Earth, people adamantly and vehemently believed in a supreme deity. Why? Is this merely primitive superstition? Is it because our ancestors wished to make meaning out of a meaningless existence? How does one define God? The image of God that is maintained by modern organized religions is one I could never understand, or align myself with. Too often, the image of a vengeful God, residing in the clouds above, judging your every move, is the one that is perpetuated. And it is all too often the people who identify with this god are hypocritical, unwavering and unsympathetic to other people’s beliefs or lifestyle choices. Is this the only image of God to which we may subscribe? God to our ancestors was something much more magical and mystical. God was ineffable and incredible. Some not even dare say his name. God is everything that was, shall be and is. God is the All and the All is God. God is the whole thing and the whole thing is holy. Whatever name you choose to deem this great creator being; God, Allah, Jah, Elohim, Jehovah, The Grand Architect, The Great Geometer, none could even come close to defining its true nature. This was how our ancestors understood God. There are two names for God in the Holy Bible, Lord and God. These two distinctions in the name of God are important to note. If God is whole and holy, a unified being, why in the world would he need two names? When looking at our cipher, we recognized that the combination of LordGod equaled 26, the same as the numerical equivalent of the Hebraic Tetragrammaton. If Luke is correct and “the kingdom of God is within you,”, and God’s true name is LordGod, why did Luke not say “the LordGod is within you”?Where is this other half, or Lord, of this great name of God? This Lord / God phenomenon is found In Hinduism as well with the names Atman and Brahman. Brahmanwas defined as the whole consciousness and Atman was the singular consciousness. The Atmanwas the individualized god within the human being, the divine spark of the creator spirit, and the Brahman was the eternal cosmic fire. Together, these two distinct aspects made for the complete whole. It is reasonable to say, that the Holy Bible wished to speak of this same phenomena. God is within all things and the God within you is called a Lord, hence why Luke did not need to say “the kingdom of the LordGod is within you.” You are a Lord. Luke just apparently felt like you may need to be reminded that the eternal cosmic fire of God, is also within you. Jesus Christ is one of the most beloved and well-known religious figures honored and worshiped today. The life and ministry of Jesus Christ has been celebrated in churches and in homes across the world. The term Christ was one given to Jesus of Nazareth, who, through a process of spiritual ascension, eventuallyrealized his true nature and proclaimed his Lordship. Jesus recognized that he, the Lordbelow on Earth, and Godabove, were united – two aspects of one unified being. Many people throughout time have come to this realization, reaching enlightenment and thus obtaining the Christhood. This was termed the christosin Greece, also known as the chrism, and this Christ character was called Krishna in Hinduism. Identifying Christ as one’s savior was not intended to be the worship of a singular man, but the recognition of an archetypal state of grace that one may achieve. Becoming Christ is the goal of Christianity. In fact, being a true Christian is nothing more than saying CHRIST I AM.Recognizing that the Lord within you and the God above are united is the highest spiritual mountain that one may ascend on this great Earth. To quote Bill Donahue once again, “Jesus Christ didn’t come to Earth to tell you how great he was, he came to tell you how great you are!” Jesus came to heal the sick and the illness he remedied was the dis-ease of human beings not recognizing the Lord within as an expression of the God above. Jesus was a man that came to preach the message about the divinity within you. This is the mythology of Christ, the Lord – a story not bound to the literal, but instead, a story about you. Jesus Christ is the Son of God. The homonym sonand sun must be noted. The sun in our sky is the bringer of life. It is our sustainer, the golden sphere in the heavens to which we revolve. Our planet chases the sun’s crown of thorns as it courses round the milky stardust of our galaxy, burning, bursting and ejecting its solar winds, along with the rhythmic pulsation of our expanding universe. It travels across our horizon throughout the year, reaching its death – but for a mere three days! – only to be resurrected and rise anew on December 25th. This Sun of God is the light that colors our existence. We are made of it and thus it is us. We are hueman beings (hue means “color”) made of chromasomes (chroma means “color”). We are deemed “persons” (per means “in the agency of”) and thus, we are, by definition, “In the agency of the son.” That son is the sun in our sky, to which the gnostic Christians gave the name, Jesus Christ. Without the life giving force of the sun, we would not exist. This is a scientific fact. Using our cipher and finding the numerical equivalent of the word sun confirms the general observation and philosophy that you, the Lord on Earth, the God in Heaven and the Sun above our heads are equal. The Holy Bible says God’s essence is light (Genesis 1:3 – And God said; let there be light) and we are, of course, made from that essence. Since we are defined as persons, hueman beings and are made of chromasomes, our language seems to corroborate this claim. Let’s go searching for this light, and what better way to do that than to look into the name of our light bringer, Jesus Christ. Using our cipher, we can put the numbers to the letters of Jesus Christ. Let us first focus on the numerology of Jesus. It is probably immediately apparent that Jesus encodes a very beastly number in his name and that is, of course, 666. This number is not a satanic or evil number at all as St. John informed us in Revelation 13:18, “Here is wisdom. Let him that hath understanding count the number of the beast for it is a number of man and his number is Six hundred three-score and six (666).” This number of wisdom is actually embedded in the divine 9 of our number line, known by the Greeks and Egyptians as the Ennead. The Ennead were the 9 gods or principals that governed the world through the laws of number. These 9 angels and their 3 levels leads us to the wise and holy number of 666 and consequently the 45 in the JE of Jesus Christ. 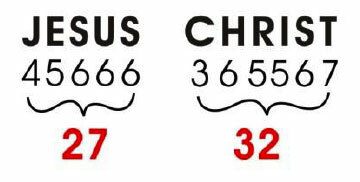 The multiplication of the numbers within the name of Christ yields us the number 4,320 (4 x 5 x 6 x 6 x 6 = 4,320). This is an extremely important number. In the precession of the equinoxes, the stars move in a retrograde motion very slowly over a vast cycle of 25,920 years. Each age, aeon, or zodiacal house is defined as being 2,160 years in length (12 ages x 2,160 = 25,920). Two ages of this grand cosmic cyclewould therefore be 4,320 years, the very number within the multiplication of Jesus. If we multiply 4,320 by 100, we yield the number 432,000. The radius of the sun is 432,000 miles. The root number we are dealing with here is the number 432, with multiples of ten showing the power of this number over different scales. The ratio of the Great Pyramid of Giza to the Earth is 1:43,200, meaning, that if you multiplied the Great Pyramid of Giza by 43,200, it would calculate perfectly the radii of both the Earth and moon, an ancient mathematical art called squaring the circle. There are also 43,200 seconds in 12 hours. 432 x 432 equals 186,624. The speed of light is measured at 186,282 miles per second – an extremely close approximation using simple math (The difference between 186,624 and 186,282 is the number 342, which is nothing more than a numerical anagram for 432!). Now let’s look at the numbers generated by the name CHRIST. CHR yields us nothing less than the number of days in our solar year, or 365. The next three numbers, when added, sum to 18 (5+6+7 =18). There are 18 years missing in the account of Jesus’s life in the bible. Many believe that these years were spent traveling, mainly to Egypt, to learn the profound knowledge taught at the mystery schools. Whatever he did and wherever he was, after these 18 years, Jesus realized and recognized his divine nature and spent his remaining time on the planet preaching it. The multiplication of the numbers, crafting the name of Christ, are quite revealing. 3 x 6 x 5 x 5 x 6 x 7 = 18,900. The square root of 18,900 equals 137.48. The degree of phyllotaxis, based off of the ratio of phi, is the degree to which leaves arrange themselves around plants, so they may receive the optimal light from our sun, the Christ. This is a fundamental degree apparent in natural growth and is so consistent that we must certainly declare it to be a natural law. The original Freemasonic compass was open to 47 degreeswith the square, or right angle, being 90 degrees. 47 degrees plus 90 degrees equals 137 degrees. This is only a mere .5 degrees off from the square root of the multiplication of the name of Christ, as well from the fundamental degree to which the botanical kingdom grows. It is also very pertinent to mention that 137.5 multiplied by Pi, or 3.142, yields us the number 432.025 (137.5 x 3.142 = 432.025), recalling 432 once again, the root number we found within the multiplication of Jesus, or 4,320. Now that we have explored the numerology of both Jesus and Christ, let’s put them together and see what our holy sun in the sky, Jesus Christ, wishes to gift us. Jesus sums to 27 and Christ sums to 32. Adding the numerical equivalent of Jesus (27), to Christ (32), equals 59. There are 59 beads in a traditional Christian rosary and this is most assuredly the reason why. We can also find 59 in Pi. 3.14159. This connection to Pi may at first seem arbitrary until one adds up these 6 digits; 3 + 1 + 4 + 1 + 5 + 9 = 23. 23, using our cipher, is the numerical equivalent of Heaven, occult, temple, beauty, chosen and natural. 23is also the number of chromosomes both man, and woman, contribute during the act of procreation. If we spell out the word MAN using our alphabet, climbing up to 7 and back down to 1, and then count the number of letters we used to do so, it will also equal 59. Before Jesus became the Christ, he was Jesus of Nazareth, or, in other words, he was a common MAN. Man, using our cipher, has a numerical equivalent of 3, which represents the Holy Trinity. To the ancients, the term MAN was not gender specific and was used to represent all of mankind. Nazareth has a numerical equivalent of 27, the same as Jesus. 27 is a trinity cubed, or 3 x 3 x 3, and most importantly, there are 27bones in the human hand. If we multiply the numerical equivalents of Jesus (27) by Christ (32) we yield the number 864 (27 x 32 = 864). The sun has a diameter of 864,000 miles – surely not a coincidence. The story and mythology of Christ is a motif shared by many other sun gods throughout history. The general story line of a child being born from a virgin on December 25th, traveling with 12 disciples, performing miracles, and his ultimate death and resurrection are themes we find within the Egyptian Horus and the Greek Dionysus. Relief of Horus with pharaos in the temple of Kom Ombo, an unusual double temple built during the Ptolemaic dynasty in the Egyptian town of Kom Ombo. This story is one shared by many cultures throughout antiquity. It is a beautiful myth that synthesizes the plight, trials, tribulations and glory of the human experience with the cyclical, redeeming path of our sustainer, the sun, Jesus Christ, our great pi in the sky. Though we currently deem our sun Jesus Christ, he has also been identified as Yeshua in the Hebrew tongue, and in the Egyptian mythos he is known by the name Horus. The name Horus itself is where we derive the terms horoscopeand horizon, two terms intimately linked to the sun’s path throughout our skies. We mentioned above that in the great year, or what is known as the precession of the equinoxes, the stars move in a retrograde motion very slowly over a vast cycle of 25,920 years. Each age, aeon, or zodiacal house is defined as being 2,160 years in length (12 ages x 2,160 = 25,920). 2,160 becomes a key, canonical number in mapping this vast amount of time. Using our cipher, and multiplying the numbers to both our sun gods, Yeshua and Horus, we find, not surprisingly, this very important number hiding between the lines. The names they may change, but the story remains the same. Jesus Christ also encodes the Precession of the Equinoxes. If we take the multiplication of the numbers of Jesus (4x5x6x6x6 = 4,320) and add them to the multiplication of Christ (3x6x5x5x6x7 = 18,900), we yield the number 23,220. 23,220 is 2,700 years shy of one precessional cycle of 25,920 years. We can find this number 2,700, to complete our precessional cycle, in a few different places. Jesus sums to 27, and this multiplied by 100 would yield us our 2,700. Further, the letters engraved above Christ when he was crucified were INRI (Which translates to; “Jesus of Nazareth, King of the Jews”). In Hebrew numerology or gematria, these 4 letters added up to 270. 270 x 10 equals 2,700. The number 270 found within the letters INRI is important to note as well, for we find this number within human gestation. 270 days is nine months, the amount of time you spent in your mother’s womb. What does childbirth have to do with the sun? In the Hebrew alphabet, Yod meant “hand”, Resh meant “head” and Nun meant “fish”. INRI, or Yod Nun Resh Yod therefore would give us two hands, a head and a fish. We can easily recognize the fish of Christ, as well as the womb of creation (defined as the waters of nun in the Egyptian lore), within the ancient symbol of the vesica piscis. This symbol expresses the birth of the son/sun from the Virgin Mary. The two hands (Yod & Yod) and head (Resh) are the first thing that emerges from the mother’s sexual organ (recognized as the central womb of the vesica piscis) during childbirth. Jesus is often depicted within this womb, with the womb very clearly resembling a fish, and hence one of the reasons Jesus Christ has the fish symbol attached to his name. One should note the mythology of Jonah and the three days he spent in the belly of a whale as another story cryptically encoding the symbol of the vesica piscis. It is also fitting to mention that fish using our cipher, sums to 23 – the numerical equivalent of heaven, circle, beauty, natural, chosen and occult. This child of god, Jesus Christ, the sun of god, who emerged from the womb of creation, represents the essence of God’s creation, the heavenly ball of light to which we revolve, and the spiritual light within you. The numerical equivalent of the world child confirms this claim. The Earth revolves around the sun in a yearly path that takes 365.24days, the exact numbers we yield using our cipher on the word child. This numerological gem hiding beneath the word child leads us to recognize, and mathematically confirm, that each and every childthat is born on this great Earth is indeed a child of God. The light of our creator sun is the light that lies within us. Taking Jesus Christ as your personal savior is nothing more than recognizing that the light of the sun, the Christ, is within you, for you are crafted by its shining glory. You are the Lordof your own manner and have the power of the Christ within you. The phrase, “Do not take the Lord’s name in vain.” is a statement recognizing the gift of life that you’ve been given. What this phrase really means is, “Do not take your own name in vain.” You are the Lord. Do not take this for granted and never devalue yourself. ART THOU SERIOUS WITH ALL THIS NUMBER MAGIC? Could all of this information really be encoded within a name? One could easily see why Christianity, and the adoration and love for this archetypal, mythological character Jesus Christ, swept across the world. The numerological elegance of the name of Jesus Christ is truly astounding. Scientific, astronomical and mathematical information is so artfully crafted within his name that it makes one deeply ponder at theheightened consciousness and gnostic wisdom of our ancestors. Our historical brethren were wise and chose to pass on information to us in very specific way so that one day, when we might need it the most,we would be able to unveil the true meanings behind the myths. Whoever created the name of Jesus Christ wanted to pass along a message to us – a message of such monumental importance, and one that our current age so desperately needs – and that message is the recognition of the divinity within oneself. The human being is a perfectly crafted vessel, made from a divine source, manifested from pure light and put onto Earth for a very specific reason. You, the Lord, are here to recognize the God within you. You are here to enlighten and wake yourself up to your true, divine nature. You are here, in fact, to become the Christ. Thanks for your time and stay tuned for another article within the next month. Please visit www.martyleeds33.com or www.schooloftheholyscience.org for more info on gematria, numerology, sacred number, sacred geometry, astrology and all things related to Pi! Thank you!